Denny Jump (Bellevue, WA, United States) on 19 August 2012 in Landscape & Rural. Thanks to everyone for your great comments on Door #1. I really like the green reflections and the white birch as well..Now this one here has different things to look for, I would thinl, like tonality and clarity - Let me know - be harsh I can handle it :-) This is "standard" Black and White treatment. The bald birch tree makes a nice contrast here i thin. What do you think? I like it, but maybe a little more contrast would make the bald birch tree stand out more. @Tamara: I am weird - when I look at other people's B&W images, I just love them, but when I do my own piece, 90% of the time, I finish them in colour...this B&W was fun to do but we'll se about tomorrow. Barbara and I had a full day yesterday so I am exhausted today ;-) Hope you are having a wonderful Sunday dear friend! I still think number 3 is the best! @CElliottUK: May the Force be with you, Luke! This one also looks good as we see that the tree is lifeless but the top branches are almost lost in the background. More contrast as Ursulakatrina mentioned might bring out those branches more. 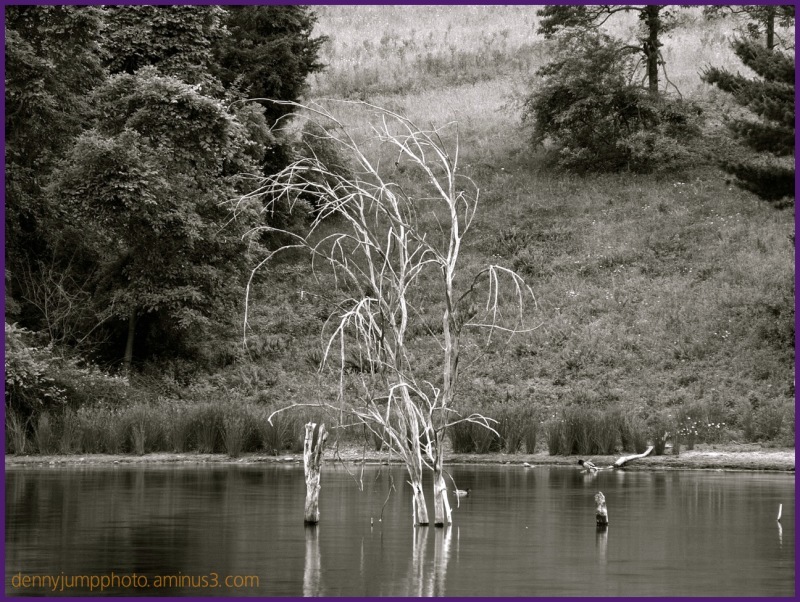 Hmmm.....I really like the water and the lone tree in this one. Not so much the background. Waiting for door #3! The tree and reflection are there but, no green reflected in the water. It's pretty anyway. Great mood in this photo ... somber and dark!